Pets Costs > Dogs > How Much Does Dog Boarding Cost? Dog boarding is a professional service that many dog owners use when going on vacation or are going to be away from the home for a certain amount of time. A dog boarding service will provide the dog with a place to sleep, play and eat, similar to the same accommodations your pet is used to having at home. The prices of dog boarding will widely vary depending on where you live, the type of dog that has to be watched, the amenities the boarding company provides, the inclusions you want and the boarding service. On average, plan on spending $10 to $30 per day for a lower-end boarding company while a higher-class “resort” can cost upwards of $45 to $65 per day. We researched a handful of dog boarding companies in the United States and included the quotes we found/received inside the table below. For example, the popular pet store chain PetSmart offers a service called “Pets Hotel.” Here, the prices can range anywhere from $25 to $100 per night. This will greatly depend on the type of service you choose for your pet since they have different levels. The standard guest room, for instance, starts at $26 per night, while the private suite can start at $36 per night. GoodDogHotel.com, located in Indianapolis, Indiana, charges anywhere from $25 to $32 per night. The prices will vary depending on the type of suite you want for your dog as well as other services you choose. PetParadiseResort.com, another pet resort franchise primarily located on the southwest side of the United States, can charge anywhere from $24 to as much as $46 per night. Again, it is going to come down to the type of suite you want for your dog. A lower-end boarding company will do all of the basic necessities for your dog. This will include feeding, exercising and playing with your dog for a certain amount of time. Keep in mind that your dog will more than likely sit in a kennel for more than 15 to 18 hours a day. A higher-end dog resort is very different than most of the ones we could imagine. As the name implies, a resort will offer a private room, more one on one attention for your dog, and many premium services such as longer walks, activities, premium treats and even daily advanced reports that can be emailed to you. Regardless of the setup, all boarding companies will include two to five outdoor sessions a day and two to three meals. If food and snacks have to be provided, plan on spending $5 to $15 more per day than if you sent food with the dog. Most boarding companies will ask that you bring your own food, especially if the dog is on a strict diet. If you want to have the dog groomed during its stay, additional grooming fees can apply. Some companies may only offer so much one on one time. If you want to have more individual time for your dog, each additional session can add to your total bill. Each session can cost anywhere from $5 to $15 each. Dogs that require medication can often see a surcharge that varies anywhere from $1 to $3 per dose. If your dog does not get along well with other dogs, make sure that you let them know this. 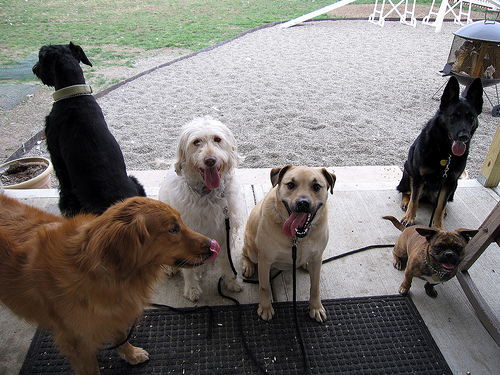 Many companies will often put all of the dogs in a yard to interact and play with each other; this would be dangerous if your dog is not friendly. 99% of the companies out there will not accept your dog if it is not up to date with its shots. To prove this, make sure that you bring along any necessary health papers. If your dog has never been away from you before, you may want to take some things to the boarding service to make them feel comfortable. For example, send the dog with his favorite toy or blanket so they will have something they can identify with. Ask your vet, if you have one, who they recommend for pet sitting services. If you have more than one dog, many boarders will offer a discount up to 20% or more. Be sure to ask them what kind of discounts they offer before booking. Try to supply your food if you have to board them for a long period of time. By doing so, you will avoid food surcharges that add up by the day. Make sure to pack a little extra food; if you run out and the service has to provide some, it will be an unnecessary expense. There is a good chance that there are more than a few boarding companies in your town. Be sure to visit and talk with at least two to three. Most are more than happy to give you a quote over the phone or in person. The easiest way to save money is by finding a local dog sitter. Perhaps a neighbor would be willing to feed the dog and let it out few times a day so that it can stay in your home where it is comfortable. Even if you choose a professional, you may find the costs will be very close to what a local boarding company may charge. Discounts may apply if you purchase more than seven nights at once. Ask the boarding company if they have any current discounts available.